250 grams natural peanut butter (we like chunky but smooth works too, be sure to choose one that is a natural peanut butter as it will contain less added salt, sugar or hydrogenated oils). 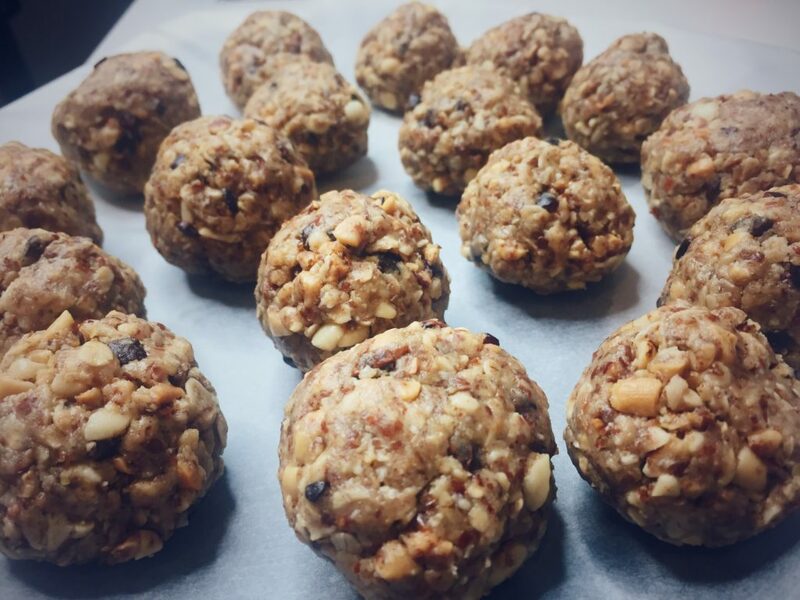 These energy bites are so simple to make! Mix all your dry ingredients together in a bowl, then add the wet ingredients. Once all the ingredients have been thoroughly mixed refrigerate for 10-15 minutes (this will help determine the consistency). Shape into balls with a diameter of about an inch. Depending on the type of peanut butter you use, you may need to add more honey or peanut butter to help the energy bites come together. If the mixture seems very dry you can also add a little water. Feel free to play around with the ingredients until you get the consistency/flavours that you prefer. You can try different nut butters, shredded coconut, dried fruits, seeds etc. The flavour combinations are endless…have fun with it! These peanut butter energy bites will keep for about a week in the fridge in a sealed container. If you fancy more health conscious recipes check out our Upcoming Classes. Our classes are only €30 per person and include demonstrations, a recipe folder, tastings and a wealth of knowledge from a professional chef and nutritional therapist. This entry was posted in Gluten intolerance, Healthy Eating, Nutrition, Raw, Recipes, Vegan. Bookmark the permalink.